E Cross L #281 Loop w/ Palace Station Cem. The sun just topped over the horizon and settled behind mid-level clouds, covering the harsh sunlight when I arrived at the E Cross L trailhead Labor Day morning. Quiet, ears ringing in the silence; engine in my jeep snaps, crackle, and pops as it cools down, almost like heaving a sigh of relieve after traveling down the Senator Highway from Prescott. Stepping out of my vehicle and stretching, I began to survey the area. There is no water and vaulted toilet available. I enjoyed the cool air trying to soak it into my body as I pulled my gear out to get ready for my hike. Naturally, I have a ritual before the hike, throw my gear on top of the jeep, put my wallet and keys in the pack, place the walking stick nearby, find a large rock; I found a large cement block to sit on instead, pull my Teva sandals off, put on my socks and pull my Hi-Tech boots. Survey the area some more, finish sipping the last of my coffee, gawd I love coffee early in the morning, and I am ready to hit the trail! The start of the trail is easy to find and so I start, uphill! The first mile climbs up to Ash Creek Ridge. Starts easy, deceiving at first, and then turns steep during the 700 feet elevation gain. On top of the ridge the trail hits Forest Road 70 and I hooked right walking just a short distance before the trail hooks left and resumes. On the right is trail # 381 going back down into Crook Canyon. I decided to break here and sit under an aged, gnarly Juniper to write in my journal. The sad thing I noted was the number of pines dead. Dead, brown, shadows of their former selves. No longer the guardians of the trail. Casualties of the long drought and bark beetles. 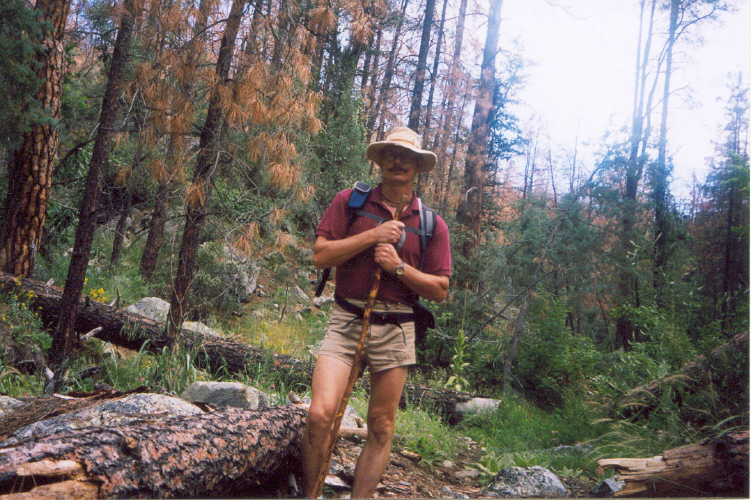 Standing bravely in death, or cut down, and what amazed me was the number of trees around the trail or across the trail that were fell I would guess because of high winds during a monsoon storm. And I am sure some fell because they could no longer support their own weight due to the cancer bugs eating them out. I say this because at one point later in the hike, in Ash Creek, my silence was broken when I heard a loud crack and the sound of crashing trees startled me. My imagination kicked in! Thoughts of a tree falling on me! Instead, it was large dead pine limb that broke, ripping through other limbs in its travel to hit the ground. A final note, the oak, junipers, and manzanita are doing fine. Rapid footfall on the ground, slapping of skin against the low shrub, and heavy breathing caught my attention during my break. I looked down the trail on which I will soon hike and spotted movement through brush. It was a runner! A damn runner running up my trail, a trail runner! Another runner followed. They stopped and we talked about the weather, trail, destinations, and the like; well I talked, they were breathing hard, taking deep breath between words. We bid farewell and they continued, hooking a left and running, stumbling, up Forest Road 70. I got up and resumed my leisure hike off Ash Creek Ridge. 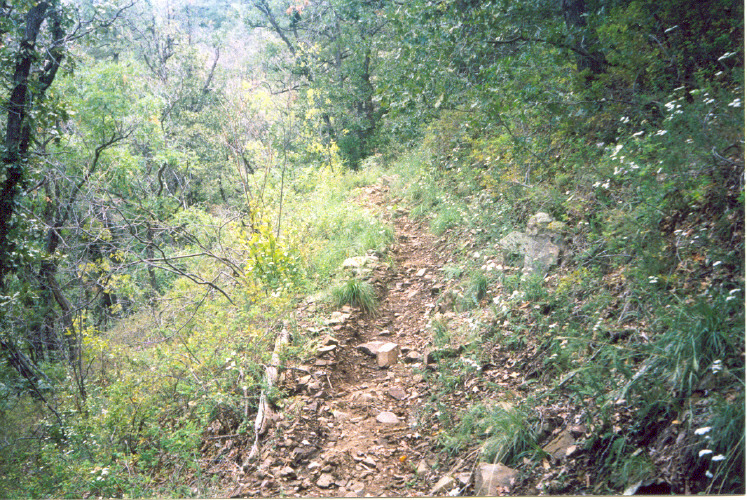 The trail down is fast, steep, and heavily eroded as it drops 800 feet to Ash Creek. 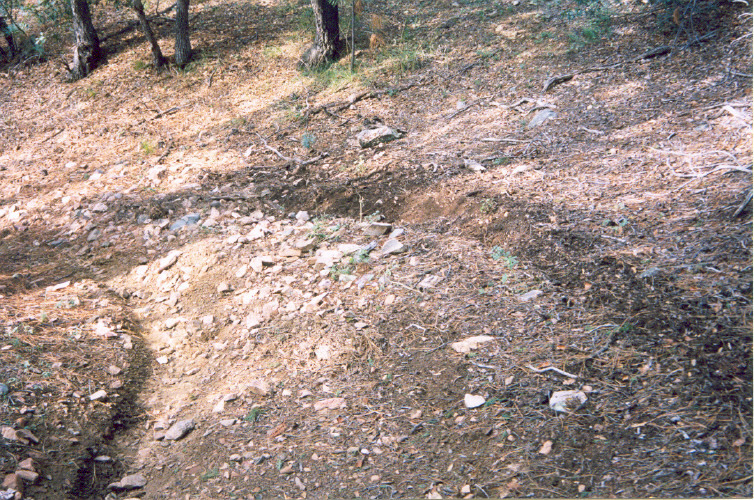 The erosion bothered me and I wondered if it was because of the dirt bikers that travel back in here, Maybe not, but I have been following motorcycle tracks since starting the hike. I am upset about this; trail 281 is designated for hikers, horseback riders, and mountain bikers, the human power kind. And here is this idiot ripping up my trail. About twenty minutes down the ridge something caught my attention left of the trail. Peering through the trees I spied a small water tank just below me. The tank for August Spring, sitting just above the creek bed. I walked down to have a look see. It was dry. I did not follow the pipe to its source, instead, I turned around returning back to the trail. From here the hike levels a bit and follows a small, semi-dry creek bed the rest of the way to Ash Creek. Small pockets of water is all that remains from the recent monsoon storms and it is clear the creek is dry most of the year. I come across a broke down gate. Passing by it I got the impression I was in a compound of sorts, I spotted another gate on the other side. Man-made artifacts from the past scattered about, foundation of a small shack, and water tank. 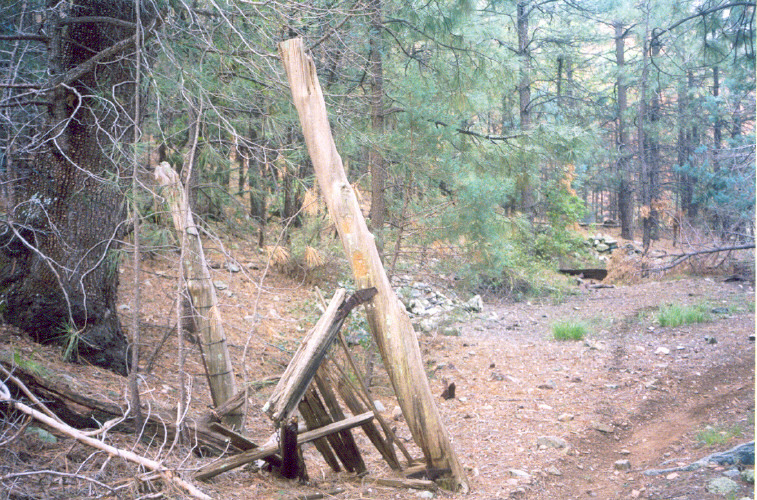 I can only guess it was a miner's home, further down the trail are signs of what looks like small mining activities. Soon afterwards I arrive at Ash Creek. Trail 281 hooks to the right. Another trail hooks left and heads to what appears to be a ranch site. I did not explore the area; time was running out, I had a cookout to attend at my daughter's home in Cordes Lake. So I plugged on climbing back up Ash Creek Ridge, via Ash Creek and through some beautiful country. The first half of the trail pretty much follows Ash Creek. It is seasonal and I spotted more pockets of water in the creek bed. Not deep enough to go skinny dipping in though. I did not locate the E Cross L spring, nor Quail spring, but I was not trying. I had plenty of water on hand still. 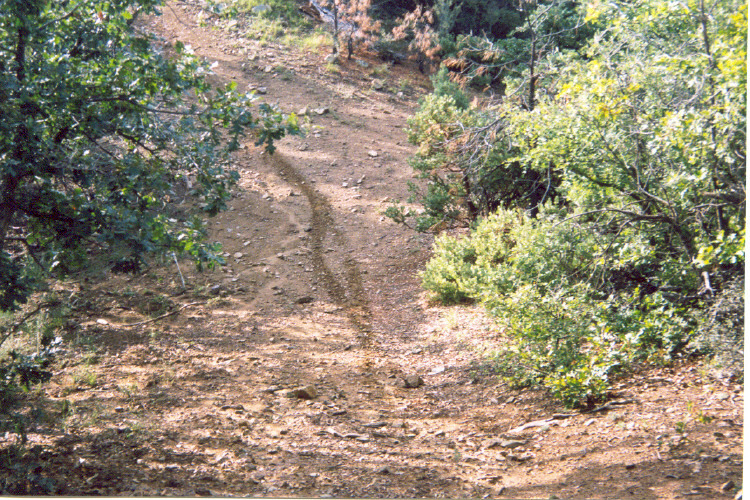 Eventually the trail does veer to the right away from the creek and I labored up the ridge until it terminated at a different point on Forest Road 70. The end of trail 281. The trail itself is 4.8 miles; however, when I hooked right I tacked on an additional 3 miles walking Forest Road 70. If you want to call it a road! I thought it was more like a trail, with numerous dead pines across it. Pretty much all the way downhill from here. Nice. My pace quicken to get back to the trailhead. O.K. The fun. In Prescott at the intersection of Gurley and Mt Vernon Street, aka, the Senator Highway, turn left. *The intersection: 0 mile. Victorian homes line the street, you begin the climb, Prescott and Thumb Butte in the background. You disappear in the forest. *Dirt road, Forest Road 52: 7.3 miles. The fun begins! I would suggest at least a high clearnce vehicle from this point. Road is narrow, with pullouts along the way. The monsoons did its best to destroy this man-made craving through the forest. *Senator: 10.4 miles. 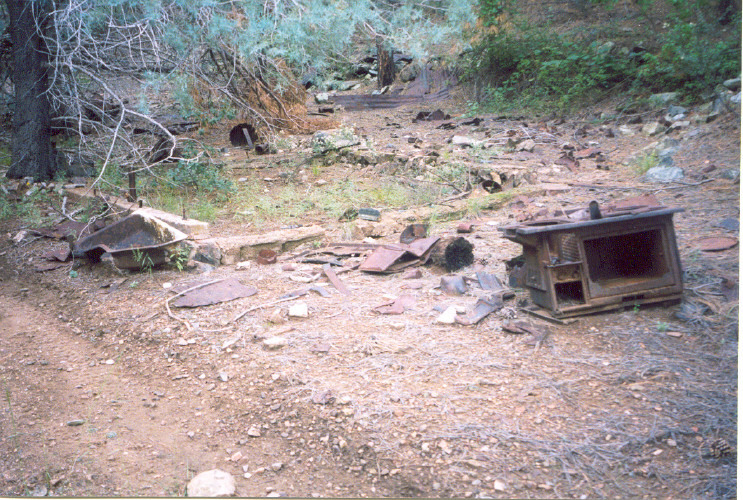 To the right, in the canyon, you can see some remains of serious mining activities of this old mining town. Just pass Senator a road turns left and heads up. If you desire to quit and head out early, this road will take you to Walker, Lynx Lake, and Costco on Highway 69. Otherwise you may go forward. *Fork to Mt. Union: 12.6 miles. Hook right, or you may find yourself plugging up to the top of Mt. Union. *Turn off to the site of Crook City: 14.7 miles. Popular camping site now. Bear to the right. *White Well: 15.1 miles. I have no idea the story behind this. *E Cross L trailhead: 17.0 miles. On the right. A one hour drive from the intersection. After the hike I decided rather than head back the same way, I would head to Mayer on my way to Cordes Lake. The mileage reflects the distance from the intersection in Prescott. *The Palace Station: 17.2 miles. From the brochure, "Palace Station is one of the few remaining stagecoach stations dating from the settlement of the Arizona Territory,,,," Half way point between Prescott and Crown King. 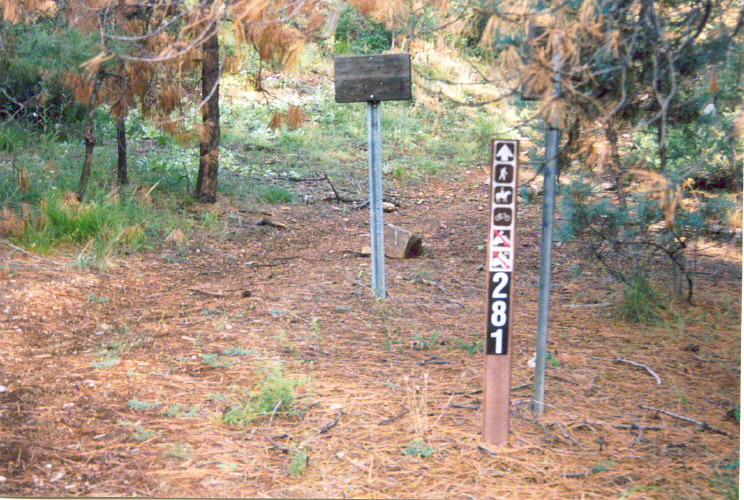 *Goodwin Jct/site: 21.2 miles. Hook left to Mayer. Or straight if you wish to continue to Crown King. *Pavement in Mayer: 32.3 miles. From here, I will let you find your way to highway 69. Have fun!